I bought some Liberty of London for Target scarves and mens boxer shorts with the intention of re-using the fabrics. 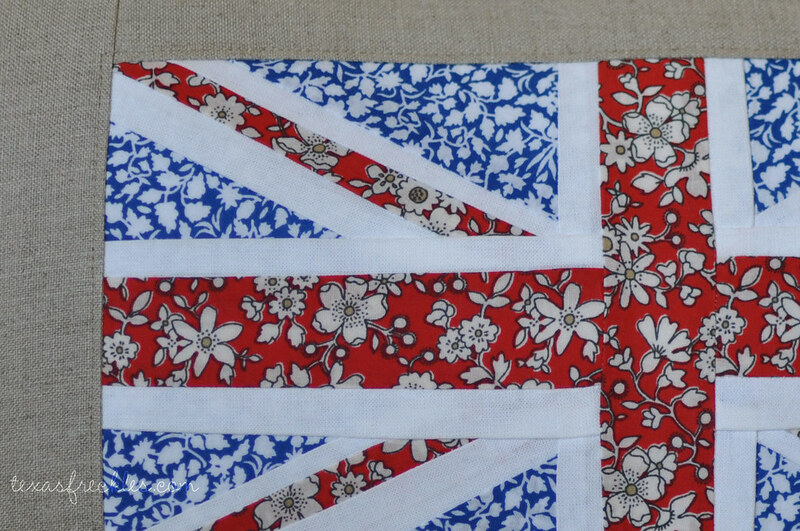 The red, blue, and white fabrics from the mens boxer shorts made me think of a flag, but I couldn't make a Texas or US flag with Liberty prints, so I made a Union Jack. I'm going to imagine that I bought it at a flea market in London. The pillow front is 100% linen and the back is Kona Stone. It turned out exactly as I imagined, but there's a problem. Did you spot it? Maybe it's odd to display the flag of another country in your home, but I do love London and Scotland is fabulous. I haven't had the privilege of visiting Ireland, but it's on my list. Plus, my great-great-grandfather was born in Scotland, so I'm a tiny bit Scottish. I think it's the Scottish in me that makes me love chips and brown sauce so much! Brown sauce rocks! So, did you find the problem yet? Someone from the UK or Australia will likely spot it more readily than I did. This flag was my first time to try a foundation paper piecing pattern. I didn't realize that it would create a mirror image of the pattern. In this case the St. Patrick's cross (Ireland; the red X), is in the wrong quadrant of the St. Andrew's cross (Scotland; the white X). See that top left quadrant? The larger portion of white should be above the red, not below it. Every quadrant is wrong all the way around. I wanted to show it to you, but I needed to acknowledge that it's incorrect because I know someone will notice. The error was unintentional and I meant no disrespect. But I still like my new pillow made from mens underwear! ETA - Lynz has the perfect solution! My flag is being viewed from the other side of the flagpole, the non-hoist side! Thanks for the information, Lynz! It looks lovely! And don't worry, I can never remember which way round the bigger white bits go, and I live here. I love Liberty fabrics, I'm always trying to think of excuses to buy them. Well I'm about to show my complete ignorance and say there's different widths of white in the union flag? And, y'know, I'm a Brit. *grins* So I wouldn't worry (and if it bbothers you, you could always send it to me - no? Worth a try.) and I do love the flowers. Nice job! "The cross of St Andrew is above that of St Patrick at the hoist because the cross was added to the flag before St Patrick's cross, therefore the cross of St Andrew is entitled to the higher position"
Go Scotland! (I'm a Scot *grins*) Although it's white higher on the top at the hoist side, so pretend your flagpole is on the right and you're good to go!! It's still an amazing cushion! Very cool! You've done a nice job and I never noticed the 'mistake' with the white cross. Nice explanation from Lynz though. So cool! Underwear on a flag!! Never noticed the error! Love it! Is that the four twin sisters pattern? I keep wanting to try it. I think it's fabulous and absolutely would not have noticed your error had you not mentioned it. Awesome pillow! Last month I made a Union Jack pillow, and trying to get the St. Patrick’s Cross right just about drove me NUTS. I’m sure mine still has issues if you look close. I have purchased men’s PJs from Target before just so I could use the fabric in a baby quilt. I need to check out the Liberty of London prints. BTW, I found your blog via the Oh Fransson Flickr grou...I absolutely LOVE your New Wave quilt – it’s one of my favorites that I’ve seen online! Great pillow! What better way to reuse men's underwear! You did a fabulous job, despite the "error". It's a 10 in my book! I'm from NZ and had no idea that the wider bits had one particular layout. oh well. I adore this cushion just the same. I love your Union Jack Pillow. It is beautiful. I wouldn't have known unless you told me, and my husband's family is Scottish and English so we have the Union Jack in our house. You did good! I want to make one too now! I love your blog. I just want to lock myself in a cabin and read your entire blog and see all that I've been missing! 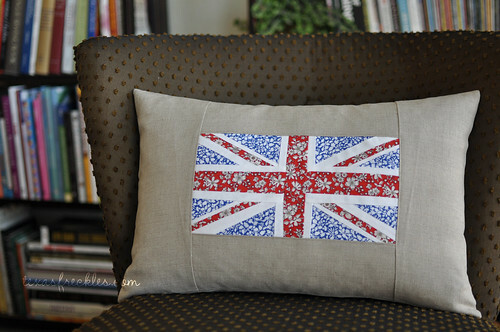 Love your Union Jack (and I like the one corner) pillow. And it's not odd to display another country's flag... not if it rocks! Besides, you can still be US Kosher if you think of it as 1/4th of the Hawai'i state flag. I love this pillow! Such a cute idea! My husband is from England, and we're headed there on Wednesday. He loved this pillow too, so I guess I will have to attempt it! that is so fabulous, what a great take on the original idea! This is adorable. 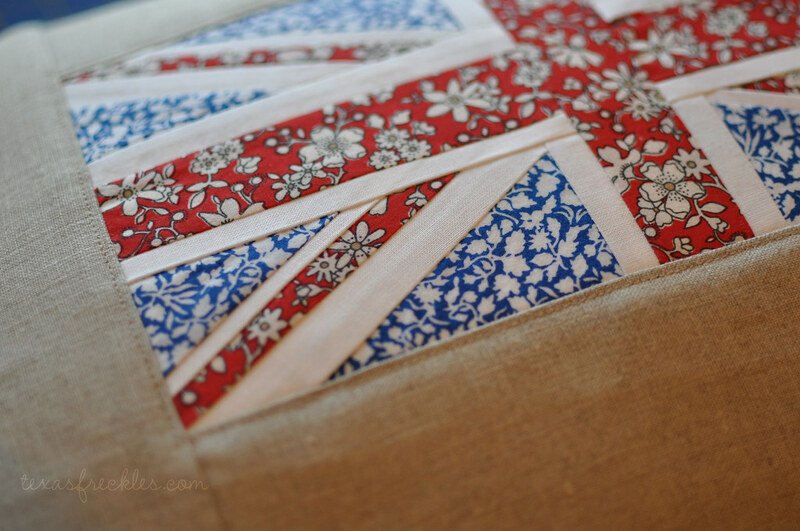 I'm an Anglophile and totally obsessed with Union Jacks. I love that it's out of the Liberty boxers! Awesome. You might try turning it upside down ? Fellow Brit here who received a lecture from an old WW2 vet for not hanging my flag up the right way once.